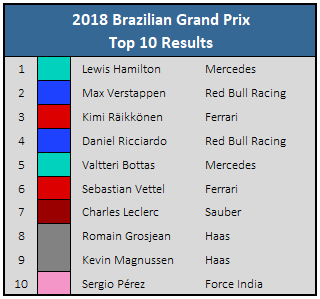 As the drivers’ championship title had already been decided in Mexico, and the constructors’ championship all but settled as well, the 2018 Brazilian Grand Prix had few stakes at play. Despite this and the inherent difficulty of overtaking at the Interlagos circuit, which boasts only one long straight, it was a good Formula One weekend. Unpredictable weather added spice to qualifying and Red Bull’s competitiveness, as well as higher-than-expected tire degradation, made the race more engaging than it might have been otherwise. 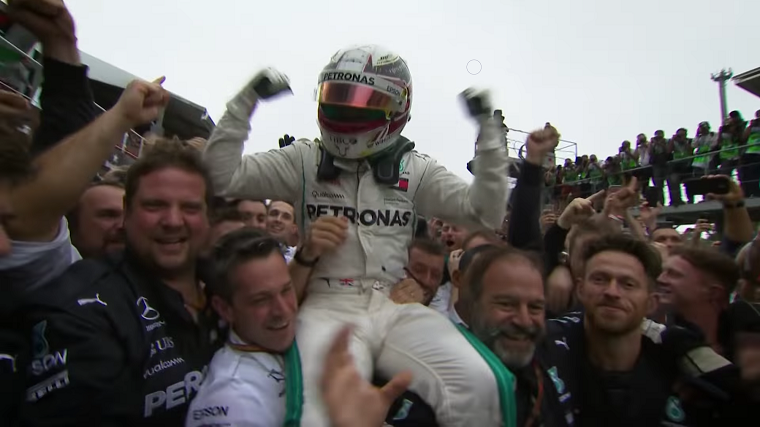 In the end, however, Lewis Hamilton was more or less gifted the win. He had started from pole and had managed to stay ahead of Max Verstappen after a long first pit window, but could not keep the young Dutchman, who was on tires both fresher and softer, behind for long. Verstappen got through the five-time champion easily and had seemed poised to win the race until a clash with Force India’s Esteban Ocon. Ocon was already lapped, but was on a much faster tire and sought some breathing room to put in fast laps and make up time in his own race against the midfield, something he couldn’t do while stuck behind the race leader. Auto Rumors: Is the Chevrolet Malibu getting a diesel engine? He got alongside Verstappen at turn 1, and while still halfway alongside as they came up to turn 2, Verstappen took the usual racing line and made inevitable contact, sending both cars into a spin and gifting Hamilton the lead of the race once more. With damage to his car’s floor and thus aerodynamic performance, Verstappen was unable to catch Hamilton again. He finished second ahead of Ferrari’s Kimi Räikkönen, who just barely managed to keep himself ahead of Daniel Ricciardo. 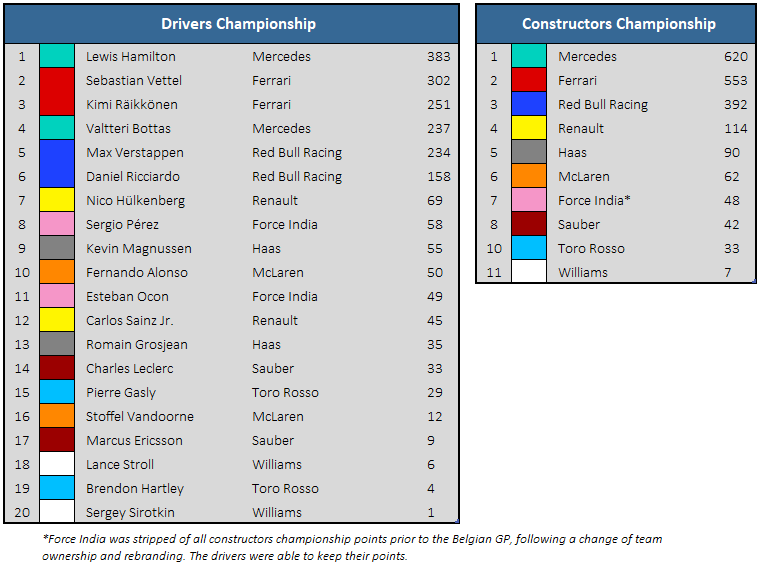 Valtteri Bottas was about as slow as usual relative to his teammate, while Vettel unusually so, perhaps as a result of low morale, having definitively lost the championship two weeks ago. The midfield battle meanwhile raged on, though the stakes there were also diminished as a result of Force India’s loss of points earlier in the season. Charles Leclerc was comfortably the best of the rest in Brazil, and teammate Marcus Ericsson will have left the race angry with himself at not capitalizing on his best-ever qualifying performance. Having started sixth, he got tangled up with Haas’ Romain Grosjean, dropped to tenth, and continued losing bodywork until he was eventually forced to retire. Nico Hülkenberg also retired from a reliability issue, though he should have enough of points in the championship to maintain his lead as the best non-Mercedes/Ferrari/Red Bull driver of the season as we head to the final race in Abu Dhabi. Car Shopping: What determines the all-important credit score?